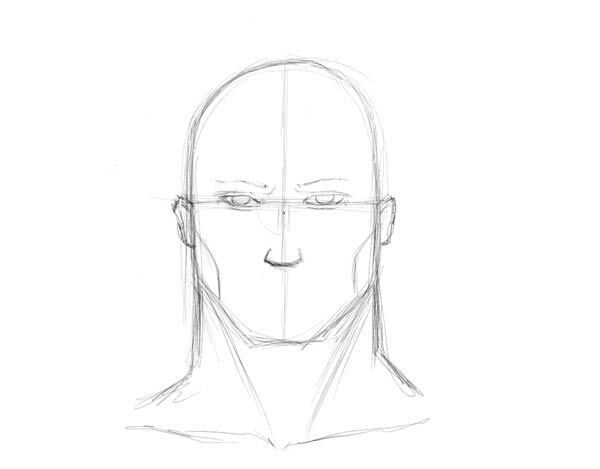 Welcome to another face drawing tutorial. 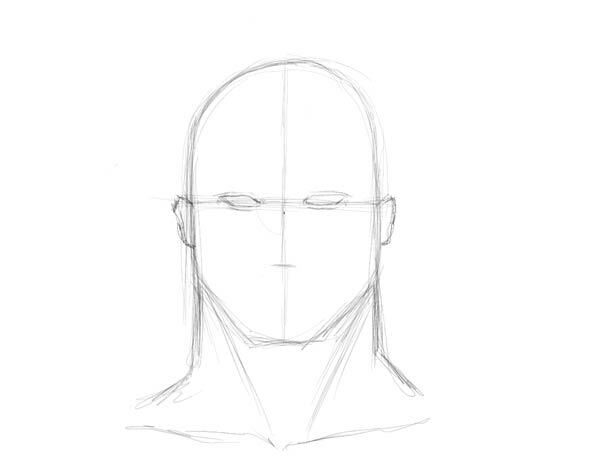 In this tutorial we’ll draw a character face of a hero-like character. 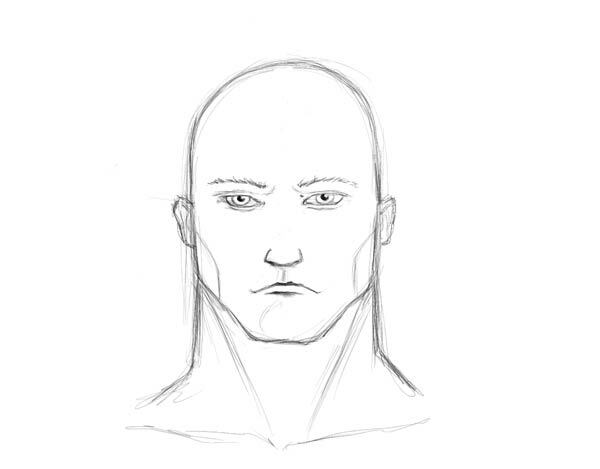 In the process we’ll review an optimal placement of the facial features and the best ways to emphasize the features of the face that will make our character look manly and heroic. I have also prepared a video of the drawing we are going to realize so that you can have an idea on how I have realized it. So if you want you can sit back, relax and enjoy the short video that you’ll find at the end of this article. However I suggest you to read through the article first and then look at the video to better grasp the drawing process. 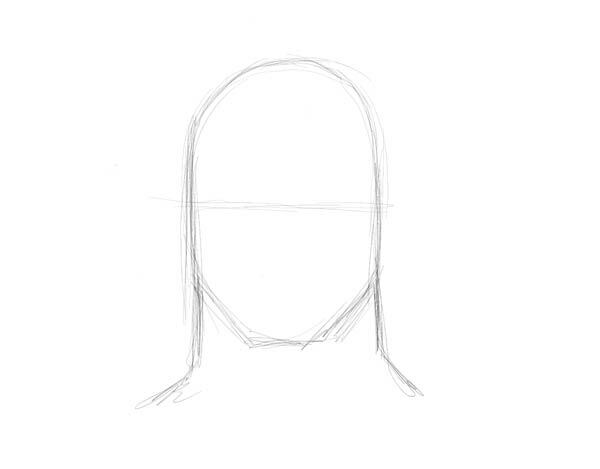 The first thing to do to start the face drawing is to define the oval shape of the head and to sketch in the neck. We are already facing a couple of choices were we want to slightly change the anatomy of the character to make it look more masculine. First the head is more rectangular and less oval. This will make the jaw line more rigid and imposing. Secondly we want the neck to be large, in fact, much larger than normal. As you can see here I have drawn the neck the same width of the face. These ar two very important factors to give our character an imposing posture and menacing and masculine aspect. Pay attention here at the shape of the eye. They are not common eyes but have a more elongated shape. This will make the character more mysterious. I have also sketched the “sternocleidomastoid muscles” two muscles that connect the lower back of the head with the upper sternum and clavicles. Very powerful and evident muscles of the neck. Face drawing continues below, keep reading! Start working loosely on the facial features added so far. Define the eyebrows and nose shape and add those two very important lines that start from the ears and go down to touch the jaw line. The lines define the presence of two lateral depressions on the sides of the face determined by the presence of the two zygomatic bones. The zygomatic bones are slightly prominent compared to the jaw line hence the skin between them and the jaw line forms a small depression. Again very important to visually underline this feature in a masculine face. We have all the basic elements to draw a tough face now all set. We have a strong jaw line, almost rectangular. Intense gaze and prominent zygomatic bones. We also have smaller than normal ears and a huge neck. Also notice the distance between the lower lip and the tip of the chin. A prominent chin is also very manly. I have opted for a slightly bent mouth here but an horizontal would have worked as well. Let’s finish this up now. 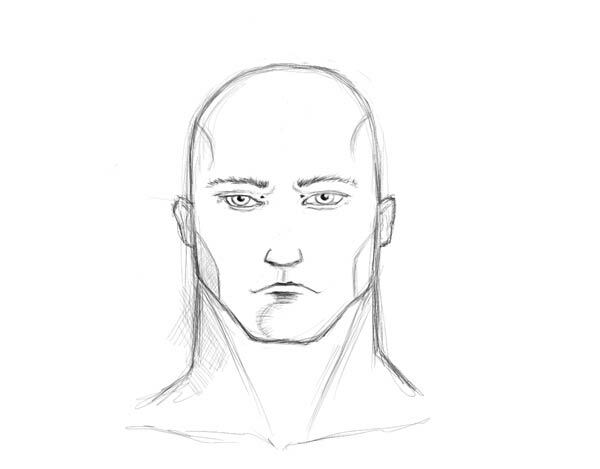 Now the final step of this face drawing tutorial. This is the refining stage of the drawing. Start working at the details of your drawing without worry anymore for proportions and positioning of features. Everything has been already taken care of in the previous steps. As you see I have just added an hint of shadowing and worked the shapes of the face. And there you have it! An intense and masculine character face! Do not forget to take a look at the video of the drawing to better absorb the techniques indicated in the tutorial!